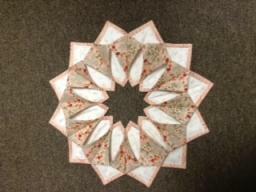 Make this beautiful folded wreath using 3 different fabrics. Add a bow and hang on your door or leave the bow off and put a candle in the middle on your table. Make one for each holiday! Makes great gifts. If you cut everything out before class, you should be able to finish this project in one session.